The Thanksgiving holiday weekend is full of events and activities in Ballard! For those interested in skipping the long lines and crowded parking lots, Ballard offers a full compliment of experiences from boutique shopping, award-winning restaurants to the best craft beverages, in our humble opinion, this side of the North Pole. 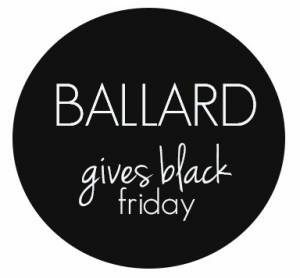 Kicking off the weekend, the neighborhood is continuing the tradition of giving, with more than twenty Ballard businesses participating in Ballard Gives Black Friday. Since 2013, Ballard businesses have decided to put a generous spin on the shopping holiday and give a portion of their proceeds to their charity of choice. Co-owner of re-souL and participating merchant, donating to YouthCare, Legh Burns said that in addition to the giving portion of the post-Thanksgiving weekend , "the Ballard merchant community is promoting a message to shop local and shop small. When small businesses thrive, communities thrive. When people support their local merchants and small businesses, more of their money stays in the community. " Speaking of shopping local it is also Small Business Saturday this weekend. Ballard has a number of stores that offer unique gifts and one-of-a-kind treasures. Whether or not you are interested in shopping, everyone needs to eat. Our restaurants have been receiving international media attention for a reason, they are awesome. No matter what your palate desires, there is something for every taste from the freshest Pacific Northwest seafood to a variety of ethnic cuisines, to a good old slice of pie (pizza or the dessert). Our restaurants offer you and your out-of-town guests an experience all those food bloggers are writing about. One of the major draws to Ballard is that it is surrounded by natural beauty. Take your visitors to the Ballard restaurant with the best view, Ray's Boathouse & Cafe and watch the boats pass in front of the backdrop of the Olympic Mountains. Okay, you probably won't see the mountains out this weekend but you can show your guests this picture in case they don't believe you. Looking for a Ballard classic? Ballard Smoke Shop is open at 6 a.m. for all you early birds and has been family owned and operated since 1971. All this discussion of food making you thirsty? Ballard has over 10 fabulous breweries within a one-mile radius, or head to Ballard Beer Company and sample them all. In addition to our Ballard Brewery District there are some cozy cocktail-making locations such as: Little Tin Goods & Apothecary Cabinet, Grog, the Bastille Cafe's Back Bar, Percy's, Barnacle, Macleod's, Lock and Keel and Stoneburners to name a few. Family Fun awaits you at the annual Ballard HolidayFest in Bergen Place Park on Saturday, November 25th from 3:00 - 5:00 p.m. Enjoy live music, complimentary pictures with Santa, popcorn, treats and find out the winners of the Tomte Trail Adventure. There is still time to follow the Tomte Trail around Ballard and find the little fellow in participating businesses. Need a passport book? Download yours today. Two bingos will put you in a drawing for the Grand Prize of a Nordic Heritage Museum's Family-Plus Membership. We are so grateful for all of our members and followers and hope to see you around the neighborhood this weekend. No matter what is on your itinerary this holiday weekend, we hope you enjoy it! Crowd pleasing party gift, a thank you to your staff or a sweet corporate gift for your favorite clients... Sweet Mickey's gift baskets are sure to bring a smile to their lucky recipient! Full artist and venue lineup coming soon! WHITE LOTUS SALON is offering 15% off all services on Friday, November 24th. Get your nails ready for the holiday party season! TIDES & PINES 40% off of select styles in the shop and a Ballard Gives Black Friday participating business. KULA MOVEMENT will take 20% off all clothing, mats and yoga props now until the end of week. COUCH SEATTLE has select floor models on sale! Include a new couch in your holiday decorating plans. SONIC BOOM RECORDS is offering an additional 20% off their existing vinyl sale inventory and celebrating Record Store Day. PORTAL VR will be opening early (at noon) on Black Friday. JOANN FABRICS and CRAFTS opens at 6:00 a.m. with a doorbuster sale. BARTELL DRUGS has incredible deals this week and a Shop Local Event on Saturday.